Bad Beat Jackpot will make your worst day the best day! Although poker is a sport in which poker skill takes an important part, sometimes bad luck finds you. To make you feel better, we implemented the Bad Beat Jackpot. We know it feels bad when you suffer from a bad beat, but don’t so much because you might get much more than what you would have got when you won the hand. The size of the bad beat jackpot gets bigger as players play ring games. 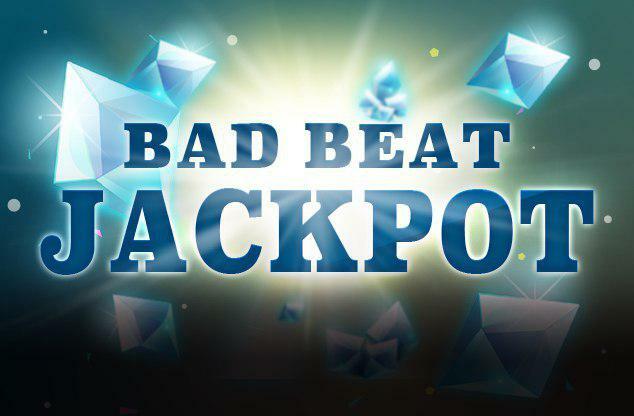 You can check out the real-time size of the bad beat jackpot in the client lobby. Today might be your day. Win your share! Once the jackpot has been won, the prize pool will be accumulated again. * Only Texas Hold’em games that collect the Bad Beat Jackpot Rake are eligible for the Bad Beat Jackpot. * Both the winning and losing players must use both of their hole cards to create the highest possible hand. * The hand must go to a showdown (played to the end, where all cards have been dealt and players have completed betting and show their cards to determine the winner) in order for the Bad Beat Jackpot to be awarded. * Only best and second best hands qualify.